His tree is the Birch, which is also known as the Lady of the Woods, Paper Birch, and White Birch. The birch is connected to writing a love letter spell. The name in the Tree Ogham, “Beithe,” has two meanings in Irish, it can mean “being,” as in “to be,” or a noun, such as “a being.” The genus name is Betula, and many consider the term “birch” came from barque, or barge, referring to the use of the bark for boats. Children’s cradles were made of birch, the inner bark provides a pain reliever, and the leaves can be used to treat arthritis. On the Isle of Man, off the coast of Scotland, criminals were “birched” to purify them and drive out evil spirits. The birth animal is the White Stag, and they direct their energy and enterprise through ambitious strategy. They are reliable, and often financially successful, one could say Jimmy Page definitely fits these descriptions. In Celtic legends The White Stag is regarded as one of the three original animals, and the blackbird, trout and stag respectively represent water, air and earth. It is connected in Celtic legend to the Underworld, and to the Green Man. 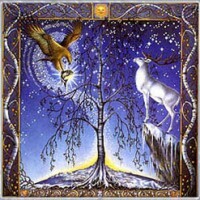 Also the Man in the Tree, or Derg Corra, is always accompanied by a stag, and is the Celtic guardian of knowledge.